This is not Purim Torah. 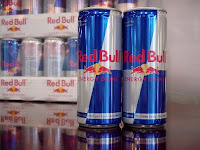 According to the Chicacgo Rabbincal Council’s website, Red Bull, both the original and sugar-free) are now approved. The Red Bull “Shots” (those are ths small little bottles that look like travel shampoo) are not approved. This entry was posted in Uncategorized on February 24, 2010 by Neil Harris. Red Bull has been kosher for years. The controvery has been over the source of the chemical taurine used in the manufacturing process. A common source of taurin is bull testicles but Red Bull assures that it doesn’t use taurine derived that way. At any rate, stick with regular Red Bull. the sugar free is just nasty! I’ve heard that it’s been back and forth even those I think the London Beis Din accepts it. 4 years ago it was fine in America, then taken off the “lists”. I agree the sugar-free tastes really bad. My understanding is that red bull can only be consumed during that fifth hour of intensive Torah study, in order to give you that extra edge to chap the pshat in Tosfos.